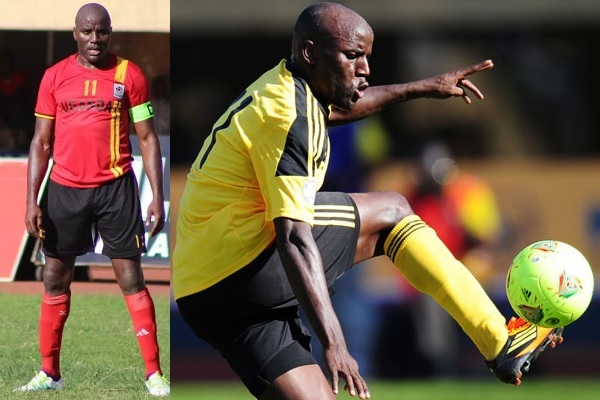 Retired Uganda Cranes striker Geoffrey Massa is nursing serious injuries on a forehead following last night's shooting at the northern by-pass. "In an attempt to stop them, officers attempted to shoot the tyres of the vehicle and subsequently injured the lady in the vehicle." Massa had parked his white Prado TX by the roadside and in the car, he was in the company of his girlfriend, Josephine Maliza aged 25. Police officers on a motorbike stopped by for a spot check and demanded to know why the car was parked by the roadside late in the night. The striker just hit the gas pedal and sped off hitting the motorbike in the process as he drove towards Bweyogere. This action prompted one of the officers to shoot at the vehicle now that they were acting in a manner that was suspicious. Massa who was driving so fast lost control hitting an electric pole. According to the social radar, Massa's girlfriend, Josephine Maliza was injured in the buttocks while Massa sustained head injuries. "Last night July 13th, 2017, there was an incident in which police on patrol suspecting a parked vehicle along the highway on the Nambole Fly Over, stopped and wanted to talk to the occupants. It’s reported that the driver, Geofrey Massa sped off in a rush sending more suspicion. In an attempt to stop them, officers attempted to shoot the tyres of the vehicle and subsequently injured the lady in the vehicle. 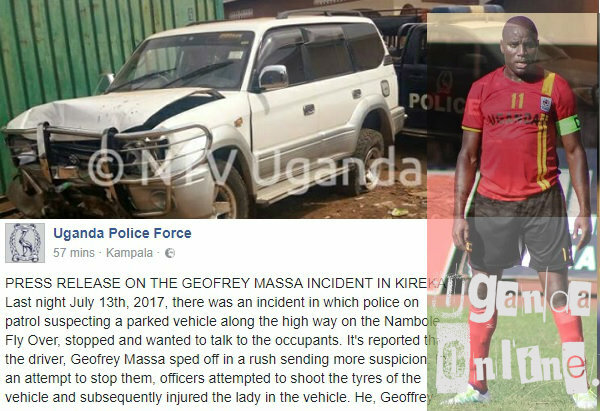 He, Geoffrey Massa suddenly stopped, almost hit another motorist and allegedly hit his forehead on the windscreen, injuring himself. He rushed to a nearby clinic called GWATIRO and he has received medical attention. The woman friend, one Josephine Maliza, appropriately 25 years old got a bullet wound and is equally getting treatment at the same facility. She is not dead, not even in critical condition, according to reports got from the medical teams handling them. The police have opened a General Inquiry File (GEF) to establish the truth behind the incident. We shall keep all informed accordingly."